The last couple of months have been a little crazy for me & I didn't get round to making a 'February Favourites' post, so this is going to be a little bit of a mix up with February & March favourites! Soooo.. let's jump right in & start with this post! Skincare is a very important part of my beauty routine as it ensures a clean, fresh skin, removes dullness and stops pimples! L'oreal Go 360 Clean Deep facial cleanser - This has to be my new favourite cleanser - it is silky, gentle and smells great - plus you get this cute little scrublet with it to really clean out your pores! I also love that it is oil free, so I don't get build up on my face! I was lucky to pick this (and the exfoliator) up in the 99p store, too! L'oreal Go 360 Clean Deep exfoliator scrub - This product also comes with a cute scrublet but it is scented like apricots and smells like you literally just juiced a fruit and rubbed it on your face! It is oil free too, and is so refreshing & invigorating - I love to use this morning & evening! Balance Snake venom face mask - what a different product! I had never seen anything like this before so I just had to try it! You only need to use this once a week but it leaves my skin so soft and clean - and toned! It is made with natural clay to absorb sebum, 'Syn@-Ake' venom to soften wrinkles and orange oil to moisturise! NIVEA Daily Essentials Regenerating night cream - I have always loved NIVEA. 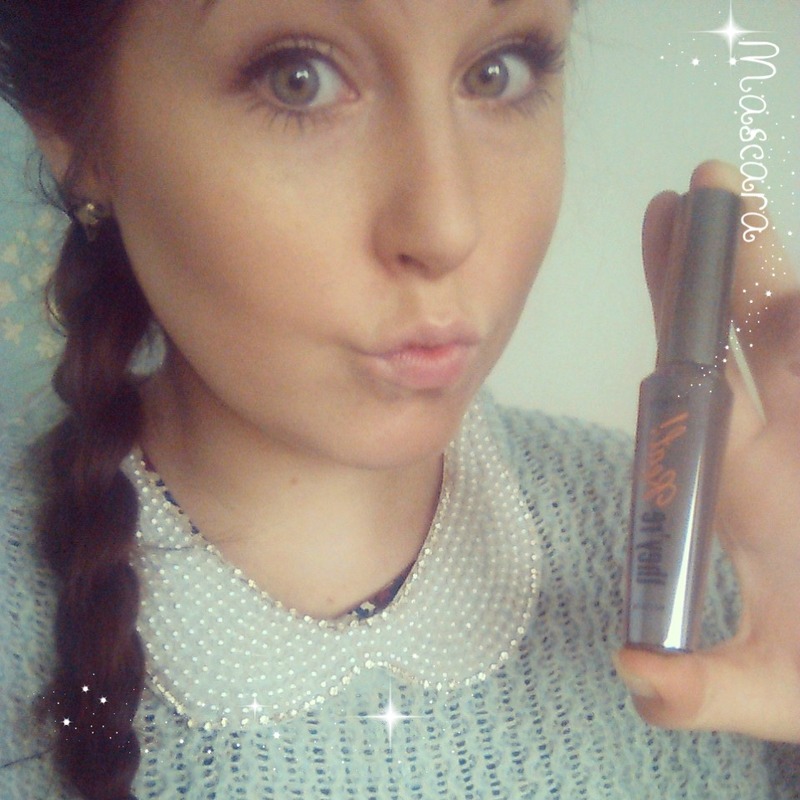 I picked this up in boots when it was in a half price offer and it has just lasted me aaages! I use it each night and it is so rich and soft and the classic NIVEA scent is so calming and comforting. Since I have been using this Dan always comments on how soft my skin is and he loves to kiss my cheeks ^_^ The great thing about this product is that it comes in variations suitable for each skin type - so everyone can enjoy it! I dont often style my hair but I do like to look after it, so trying new products is always fun! Nspa Full body Shampoo & Conditioner - I picked these up whilst Dan & I were shopping, as they were on offer. I had heard of Nspa Before but never used them so I chose the full body range which is designed for lifeless hair. As my hair is soooo long it does tend to be a bit lifeless as it is weighed down, so, I thought this might be a nice thing to try. The products smell nice - typical shampoo scent really (I still prefer the Aussie scent), but they do foam up nicely and leave hair super clean. I have found that you really have to make sure you have washed out every ounce of this product or your hair can still look greasy when its dried and feel a little 'slick', but, overall, I loved the way they made my hair look and the bottle design is very easy to store, plus I love the colour scheme!! The Nspa products are exclusively available at ASDA. Batiste Dry shampoo - I LOVE dry shampoo - what a great invention! My hair only needs washing ever 3-4 days so this is great for those inbetweeny days!! This one is also my new favourite as it has a hint of colour (you can choose the right one to match your hair colour), so it doesn't leave my roots all powdery looking. The scent isn't the best but it doesn't hang around long, so no need to worry! This is a little expensive at £3.99 a can, but more often that not its on offer so you can pick it up for around £2! Rock your hair 'get a lift' volumizing spray - my sister bought me this for my birthday and it has lasted ages! I spray it into my roots after I have washed my hair and, once dried, it is noticeably pumped up! The bottle is awesome too - hot pink, easy grip & embellished with iridescent rhinestones - what more could a girl want ;) The smell is really nice and fresh and it doesn't feel heavy or crispy in my hair at all!! I also love that this product reduces frizz - as I have a serious frizz problem in the muggier months! This month, on my never ending quest for a flawless face I have come across some fantastic products! Revlon Photo Ready Perfecting Primer - This is a little more costly than products I'd usually buy but I had some birthday money and there was a 3for2 offer on Revlon so I had to pick it up. I will be doing a more in depth review of the Revlon photo ready makeup but for now Ill just say that this is worth every penny. 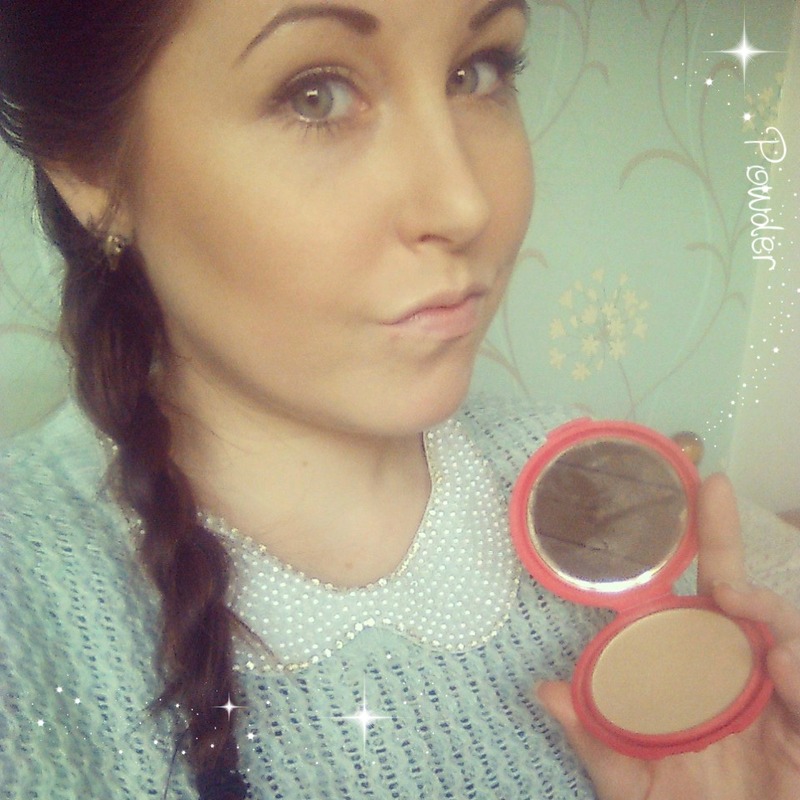 It really blurs the skin, covers problem areas and makes for a perfect base! 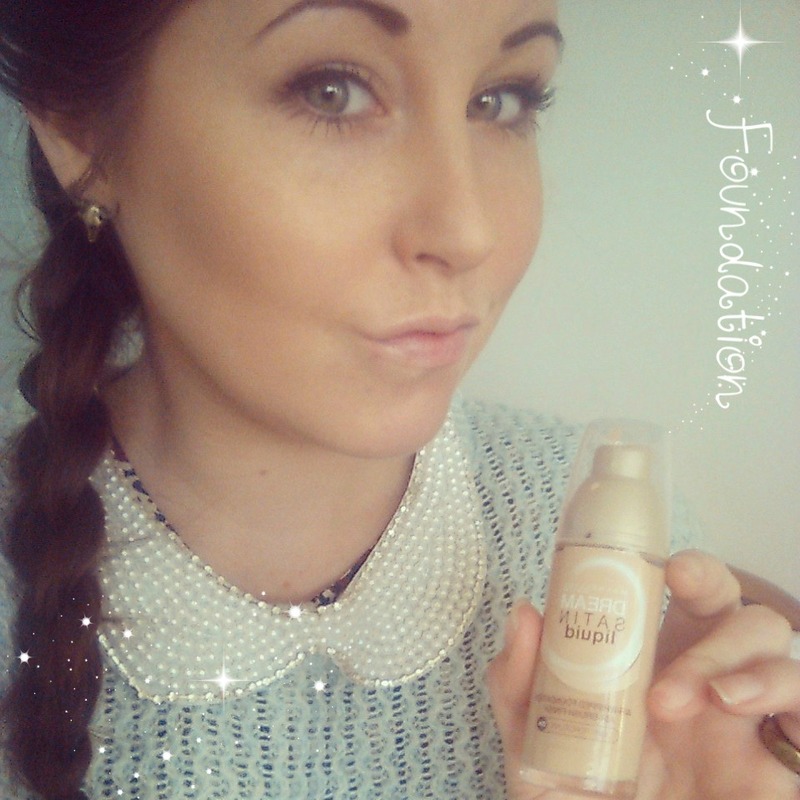 Revlon Photo Ready Foundation- This is photoshop in a bottle! Great coverage, large range of shades, and wonderful pump dispenser! You only need to use a tiny bit for perfect results so you know you are really getting your moneys worth with this! Real Technique Brushes - I have heard a lot about these brushes through Instagram recently and I really wanted to get my hands on some! 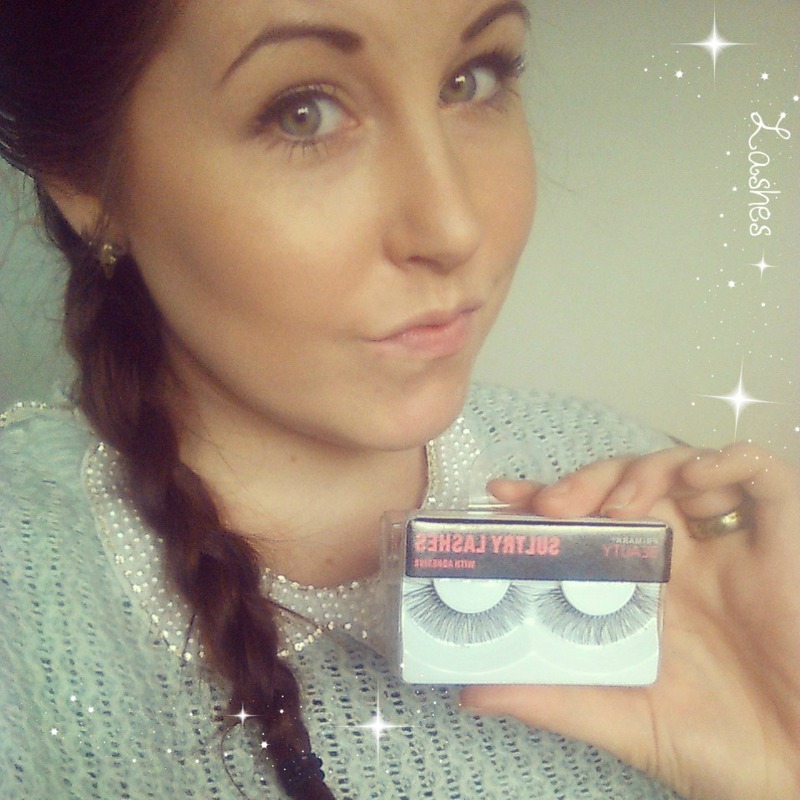 I will be doing a full review of them soon as I love them so much but they really have become a everyday staple for me so I had to include them in my favourites! I have the expert face brush, powder brush and shading brush - each have beautiful soft bristles and comfortable handles for expert blending! They are about £8-£12 each and are worth every penny. 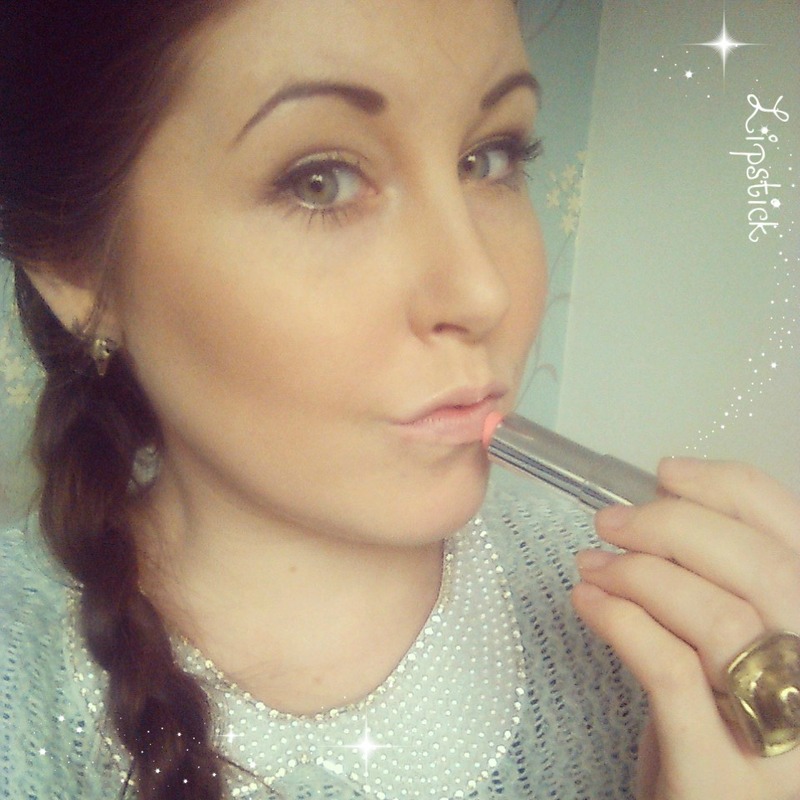 Makeup application is so much easier when you have the right tools, so they are a brilliant investment! With spring here, I really like to take more time on my nails - since they wont be covered by long sleeves or gloves, why not?! Models Own Nail Polishes - Models own is a brand I have only recently found, but I love their products so much and just want every single thing haha! Here are 2 of my favourites. 'Blueberry muffin' a pastel coloured blueberry scented polish which is perfect for spring and beyond! There is a little scratch'n'sniff patch on the lid so you can test the scent, its so cute and applies smoothly and easily. I also have 'Indian ocean' a gorgeous opalescent blue with hints of pink and white which looks great topping blue polishes - and also hot pinks for a summer twist ;) These polishes are priced at £5 each but models own regularly run offers on them!! L.A Girl dry booster - this is a great little bottle to have in your polish set. It helps to speed up the drying time of nail lacquer so you don't have to sit for hours waiting for your nails to dry! It paints on like polish but doesn't have the strong scent! I got this in Beauty Bay in Westfield shopping centre in London but it is also available online. Fragrance can totally change your mood and define you, so its nice to see what's out there and find your perfect scent! Katy Perry 'Purr' - I love Katy Perry. She is everything I love - fun, individual and happy! I was so pleased when Dan bought me her scent to try out! The bottle is this cute kitty shape with jewel eyes and a charm on the neck and the scent is so girly and fresh - it smells peachy and pretty and I love wearing this during the day, on a shopping trip or - anywhere really! Kate Moss 'Kate' - I picked up this perfume in a set with a body lotion in the boots sale for only £7.48. It isn't the type of scent I would usually wear but I liked that! Its quite a grown up smell, musky & floral, but it is still girly and pretty! It lasts on the skin for ages and the bottle is very simple and pretty! 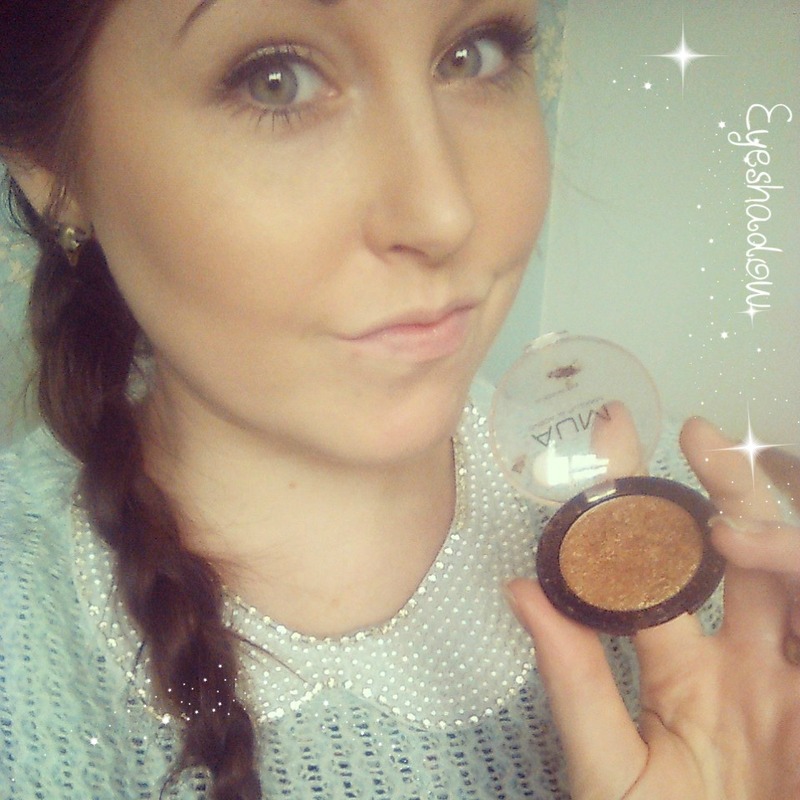 I'm glad I got this when I did as it is very different for me & I'd definitely buy it again! I Love... Strawberries&Cream spritz - This is so sweet! My Dear friend bought me this as a treat and I just use it all the time! It smells exactly how you'd expect and is just so light and refreshing! I wear this when I am not going out anywhere but still want to smell nice and It is also nice for warmer days at the beach! Yankee Candle Wax Tarts - Fragrance isn't just about perfumes, I also love to have a nice smelling home! Dan & I have been addicted to Yankee wax tarts for ages now - their range is ever expanding and there is a fragrance to suit every person & occasion - I love the sweet smells and Dan loves the fruity smells, so we always have a nice smell drifting around the house! They cost about £1.20 each but you can just break them and use a little at a time so you get lots of use from them! Favourites this month are 'Summer Scoop', 'Strawberry Buttercream' & 'Pineapple Cilantro'! Mmmmmm! Shamefully, I rarely read, but if there is a book that I really want, then I will make the time to sit & appreciate it! Company Magazine - I don't usually like to spend money on magazines, as they are quite expensive and all say the same thing, but when I do, it is always 'Company'. I feel it is age appropriate, includes articles I am actually interested in & can relate to, and the pages are so cool - not all glossy and slippery like other magazines! This months issue featured an article about Youtube sensation Zoella - so I really wanted to buy it, she is a big inspiration and a great role model! There is lots of fashion advice and there is also a Free Tube of Mascara as a gift! Water for Elephants - I have read this book lots of times but I have just picked it up again this month. 'Water for Elephants' is one of my favourite films - it is so beautiful. I didn't realise that the film had been adapted from a book but one day Dan surprised me with it, and I couldn't stop reading! It is engaging, exciting, touching - everything you want from a good story, it is also based on true circus facts from that period so it is very interesting in that aspect too! I would recommend this book to anyone - man or woman, young or old, it is great from start to finish and you will read it time again! 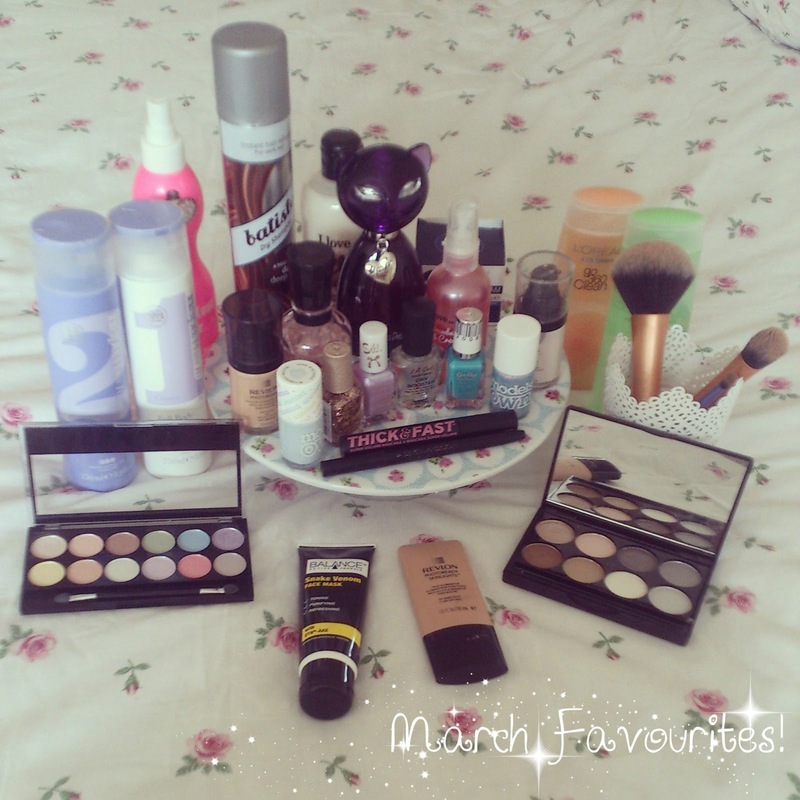 I hope Ya'll enjoyed my March Favourites! Is there a favourite product of yours that you suggest that I try for the next month? Mothers Day is approaching & its time to think about how we are going to spoil our mum's and show them how much we love them! 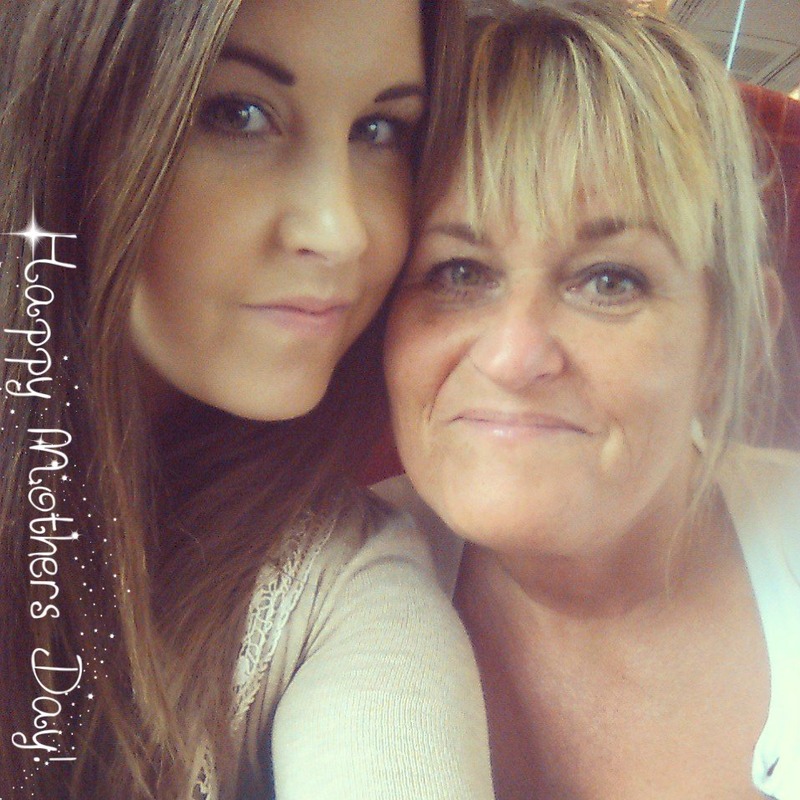 My mum does so much for me - even now that I've moved out, and I really like to show her how much I appreciate that - especially on mothers day. We had a Party for my mum Last weekend (as she is away on holiday on mothers day), and it was a lovely way to get together and spend time with family! As well as giving a gift, I always like to hand make something - it shows that you really put thought into the gift and spent time to make something that they would really like. An easy way to do this, is to bake - whether you are a baking novice or an experienced chef, baking is a fun past time in which you can get creative and make a one off for someone special! So, in this post, I am going to show you some easy tricks to make some beautiful cakes, Just for your mum, with one basic recipe! <3 This is a basic sponge recipe that I use for nearly all my cupcakes & will make you 10 large cupcakes. 1. Start By Pre-heating your oven to 180C (350F/Gas4), this will allow for an even temperature in the oven once your cupcakes go in! Also Prepare your Muffin tray with 10 cases! 2. In a large bowl, cream together the butter & sugar well, until pale & creamy. 3. Gradually add in the beaten eggs & vanilla essence - mixing well. 4. Then, sift in the flour and gently fold it into the mixture. If it is still a little stiff, slowly add the milk until you have a creamy consitency which will drop well. 6. Remove the cakes from the muffin tray and allow to cool completley before you begin to decorate! 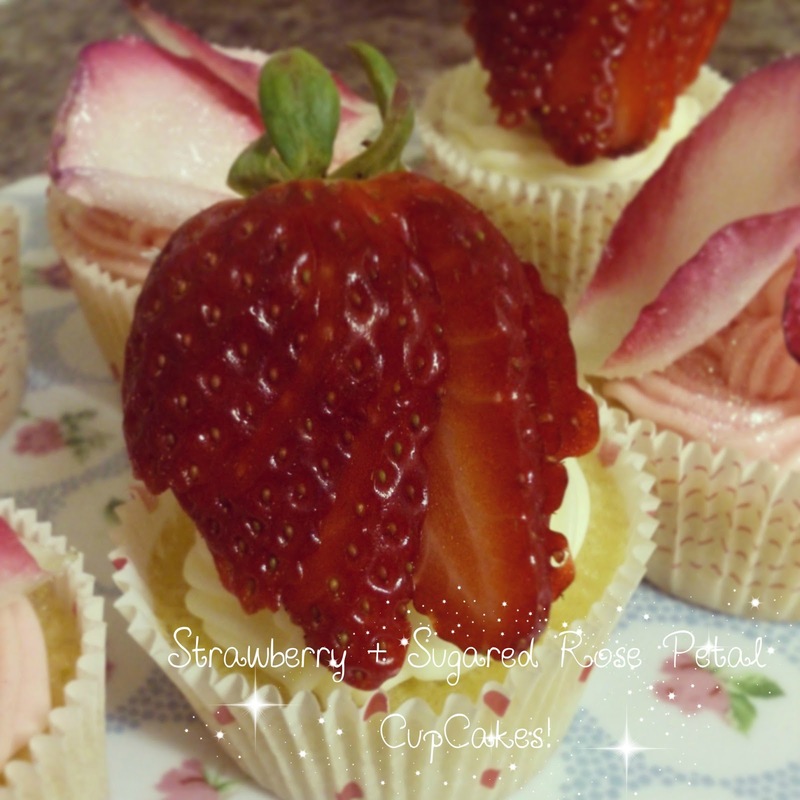 My first Decoration Idea is Strawberry & Sugared rose petal cupcakes - they are so sweet & perfect for mothers day! The sugared Rose petals add an adorable touch, while the sliced strawberries add a little luxury! - First you need to pull the petals from the rose - do this gently to ensure that they dont rip, pulling from the base with one swift pull. Do this immediately before you are going to sugar them so that they stay looking fresh. - Very gently, dip them into the beaten egg and let any excess drip off (or they will take ages to dry!). Then lay them out onto a plate. 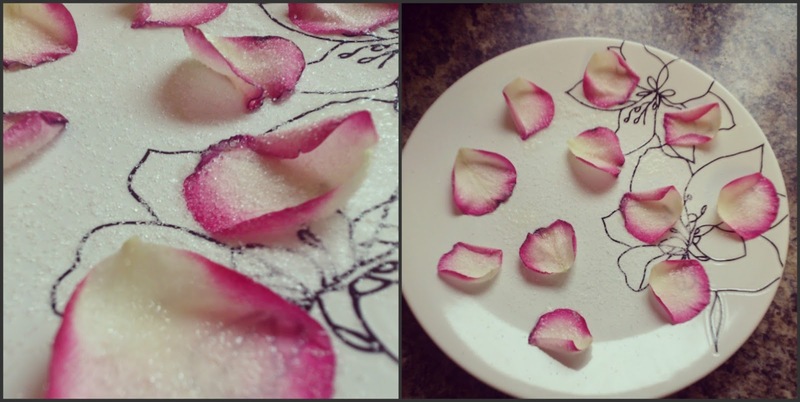 - Sprinkle the sugar over the rose petals, turning them to make sure that they are completely covered. - You will need to leave them to stand for 2-3 hours so that they dry fully (they will feel a little stiff or crispy). Once your Rose petals are dry, you can frost the cupcakes! - Start by combining the Butter & Icing sugar - this will be stiff but keep with it! - Add your vanilla and gradually add the milk to slightly soften the mixture - you need it to be quite thick so that it holds it shape once piped onto the cake! - Split the mixture into 2 separate bowls and add a few drops of pink food colouring to one half until you get the exact colour you want. - Once this is done you can either spoon it straight onto your cooled cupcakes or you can pipe it on with your favorite shaped nozzle - You can buy a great piping set from Lakeland here, their baking tools are my favourite!! Once your cupcakes are frosted, you can delicately place the rose petals onto the pink cupcakes. I placed 3 onto each cupcake in a triangle shape so they could be seen from each angle. I placed sliced strawberries onto the white cupcakes for a nice contrast in colour. You can easily slice the strawberries by cutting through them bottom to top, but not so far that they go right through and fall apart, you can then gently fan them out and place them onto the cakes! These cupcakes look so yummy and beautiful and are sure to make your mum smile! 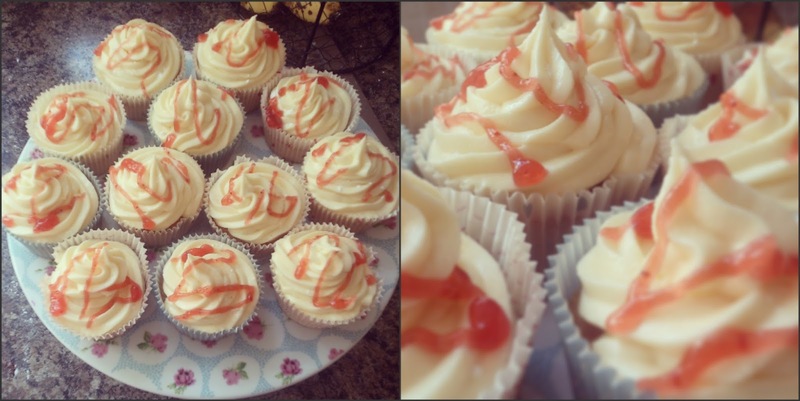 They are so easy to do but look so professional and taste amazing! Try to eat the strawberry cupcakes on the day they are made, or the sliced strawberries can make them a little soggy. 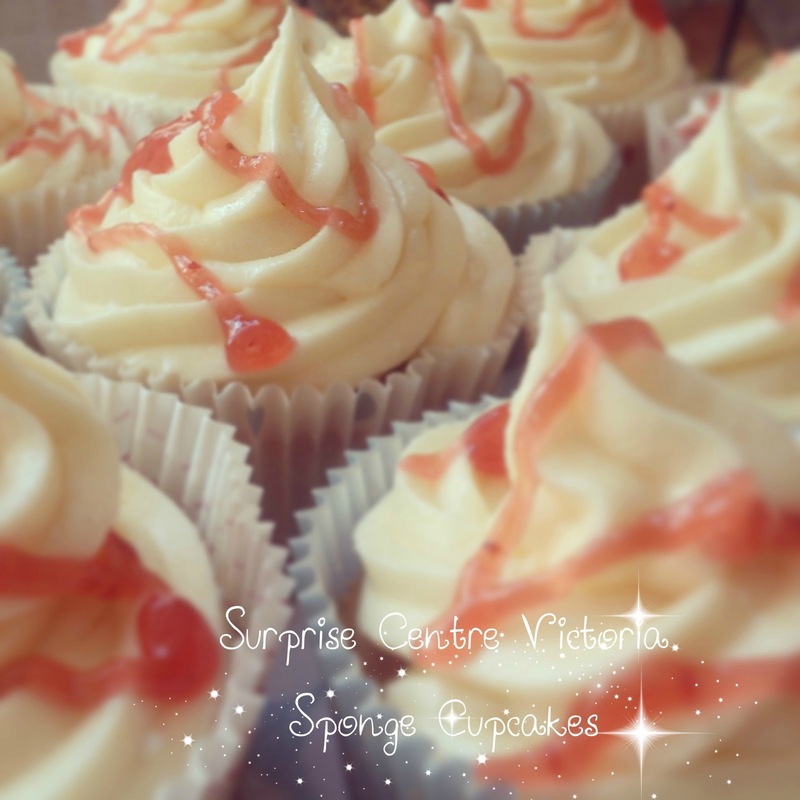 The next way to create beautiful cupcakes for your mum is these Surprise Centre Victoria Sponges! These are a cute alternative to the popular traditional Victoria sandwich cake. In addition to the cupcake ingredients and frosting ingredients, you are going to need some smooth strawberry jam. Start by making the basic cupcakes with the same recipe as above and allow them to cool. You will then need to get a cupcake corer (like this one from Lakeland) & remove the centre of your cupcakes - try to leave a bit of cupcake at the bottom so the surprise centre wont spill through and make the case all soggy! If you don't have a cupcake corer, you could use a teaspoon to do it too! You can then fill the hole in with some smooth strawberry jam! This is such a lovely idea as it is so unexpected and a sweet surprise! Once this is done, you simply need to frost the cupcakes! I chose to keep the frosting at its usual colour! They already look so yummy! But as a finishing touch I filled my icing pen (like this one, also from Lakeland) with some more strawberry Jam and delicately drizzled it over the top in a swirly pattern! These cupcakes are also super easy to make, but the surprise centre gives them something a little different! 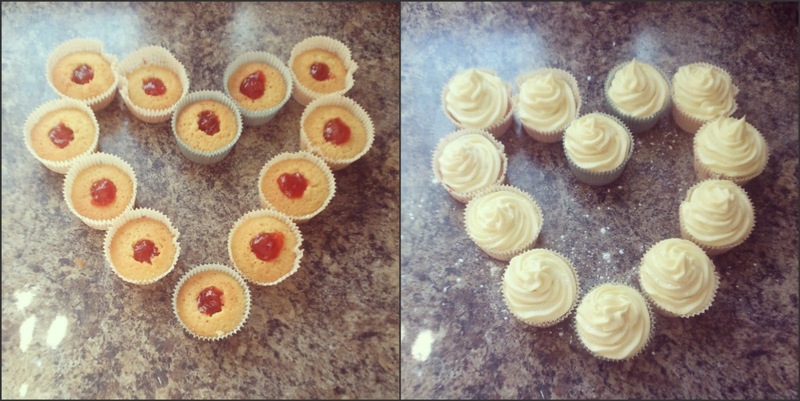 I recently made some of these for Dans family and they all said how much they loved them! Whatever you decide to do with a basic cupcake recipe, Just have fun and get creative - there are so many options, designs, colours & flavours to chose from and your mum will love them! Ever since I was sent a tube of the new Colgate Max White One Optic Toothpaste to try out (you can see my review here), it got me thinking about how far oral hygiene & 'tooth technology' has come - did you know that The Ancient Greeks created a recipe for toothpaste by mixing abrasives such as crushed bones and oyster shells, which were used to clean debris from teeth - Eww! The Romans then added powdered charcoal, powdered bark and more flavouring agents to improve the breath. Just look at how far we have come since then - you can whiten your teeth in an instant, and change the shape, size & design of them to however you desire (assuming you have big bucks, of course!). 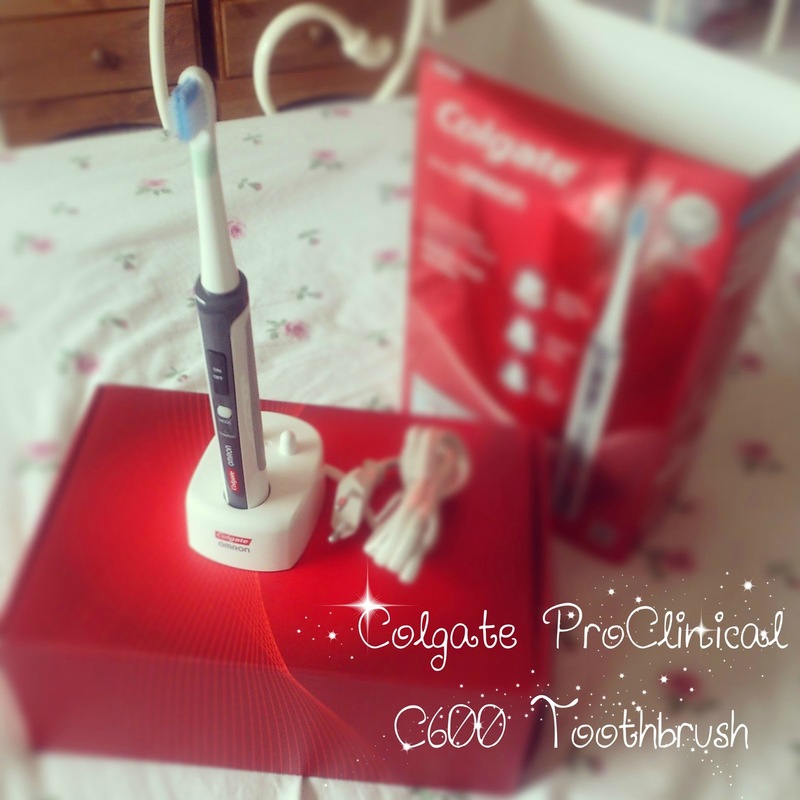 So, when Lauren Offered to send me the New Colgate ProClinical C600 Electric Toothbrush, I was very intrigued to try it out! 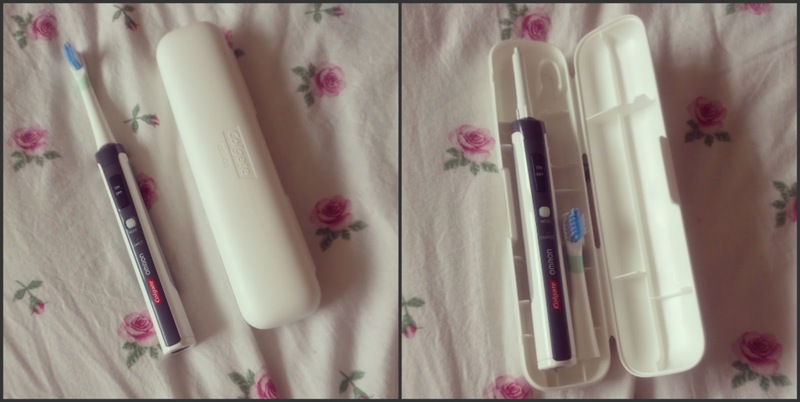 I have never tried an Electric Toothbrush before so I really looked forward to testing this out & when it arrived I was certainly not disappointed! This toothbrush promises to promote healthier teeth & Gums by using 3 brushing modes (not just speeds!) with distinct cleaning action. It features 30,000 strokes a minute with sonic wave cleaning, a slim & lightweight design, a cute travel case & a fancy timer! 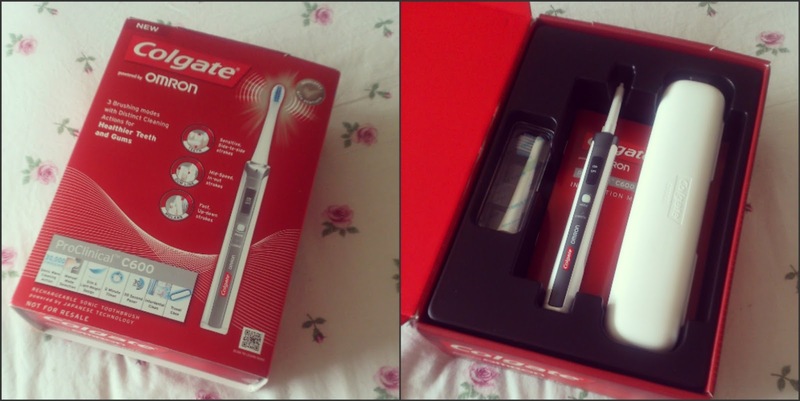 The toothbrush is priced at £99.99 & comes in the recognisable Colgate metallic red packaging. Inside, the components are packed securely and neatly so you can see exactly what you get! The box includes The toothbrush body (with a little charge so you can use it right away! ), a 'Triple clean' brush head - tightly wrapped so it is clean & fresh, a sweet travel case, a charger & an instruction manual. I really like the fact that it comes with a travel case - I have to admit this is more than I would usually spend on a toothbrush, so the fact that it comes with this protective case is very comforting! The design of the case is also very fitting with the slim design of the toothbrush - it is compact, neat and stylish, everything has its place inside, and wont 'shift during transit' haha! The triple clean head of the toothbrush is my favourite part! I really like the fact that it has so much power, but is still small - it isn't uncomfortable in the mouth at all. The brush features spiral bristles which help to remove tooth stains, tapered bristles along the outer edges to deep clean the gum line and lots of inner bristles to help remove plaque! 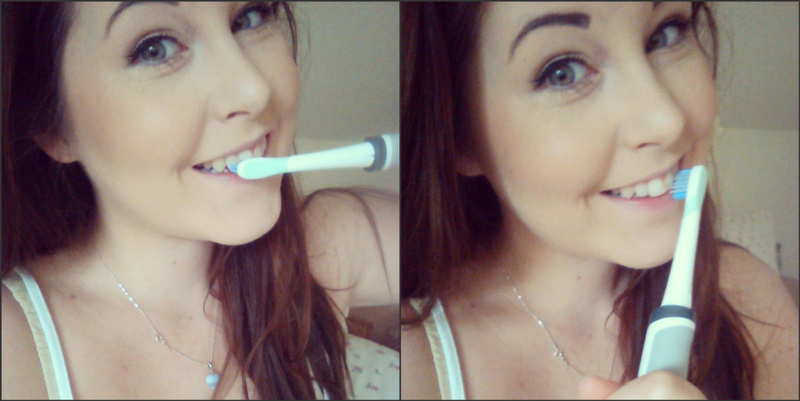 I still cant believe how clever this toothbrush is! It doesn't just have different speeds, it has different modes so it specially targets and cleans your teeth just how you want it to! It has a white light (or 'optimum mode') for if you want to target your teeth & gum line. This mode allows the brush to pivot from side to side at mid speed. It has an Orange light (or 'sensitive mode') for gentle cleaning of your teeth's surface - this one is my favourite! On this mode the Brush moves side to side with a low speed. I think I like this mode best right now as I have never used an electric toothbrush before so it is easier to get used to the tickliness at this speed! The final option is a Blue light (or 'Deep clean Mode'), this mode cleans very thoroughly behind and between the teeth - the brush moves up and down at high speed in this mode - it feels like a mouth massage! And as if this wasn't clever enough, the toothbrush makes sure that you spend enough time cleaning your teeth, too! You start by cleaning 1 quarter of your mouth and after 30 seconds the timer alerts you to move to the next quarter and so on! Then after 2 minutes the brush automatically switches off so you know that you have finished your whole clean - and it will not waste battery!! How clever is that?! I really love this toothbrush, and after feeling how clean it makes my mouth it really makes me think that I would spend this much money on a toothbrush in the future. There is nothing worse than toothache and mouth problems - not forgetting the dentist bills that come with it, so it seems smart to start protecting your teeth from home to avoid this! I have been brushing my teeth with this twice a day since Saturday and it already makes my mouth feel much better - as though I have cleaned every single nook & cranny! I am so happy with it! 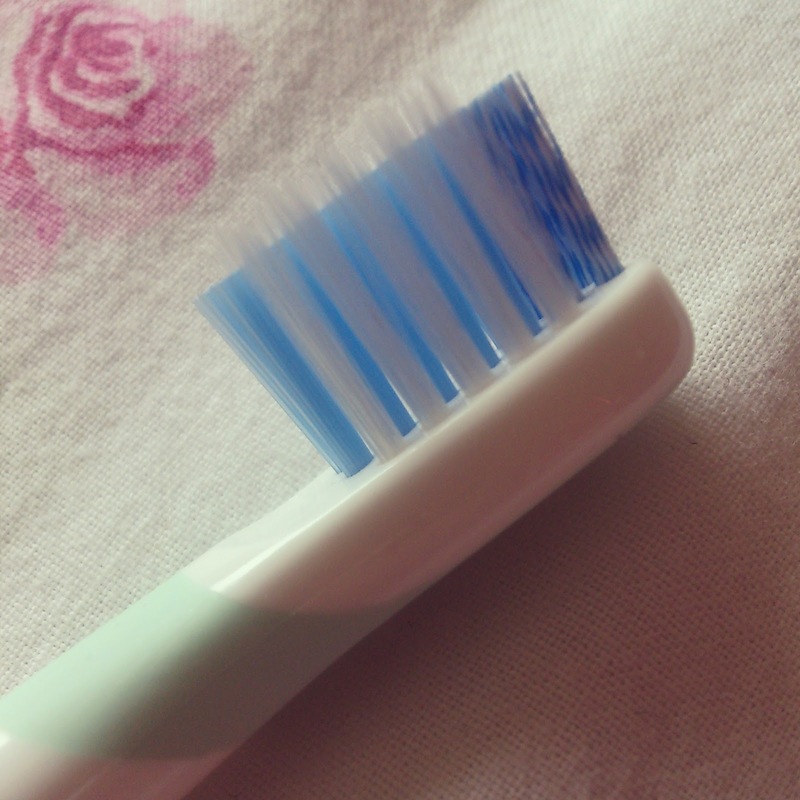 Have you tried an electric toothbrush before? What did you like best about it? In the spirit of the #ManicureMonday trend, I thought I would share with you my thoughts on my new Favourite Nail Polish! Barry M Need no introduction - I'm sure you have all tried something of theirs before, and I'm almost certain you will have loved it (if not -give them another try!). I've become a big fan of the brand recently and they seem to be forever releasing new amazing collections and adding new lines for us to drool over! 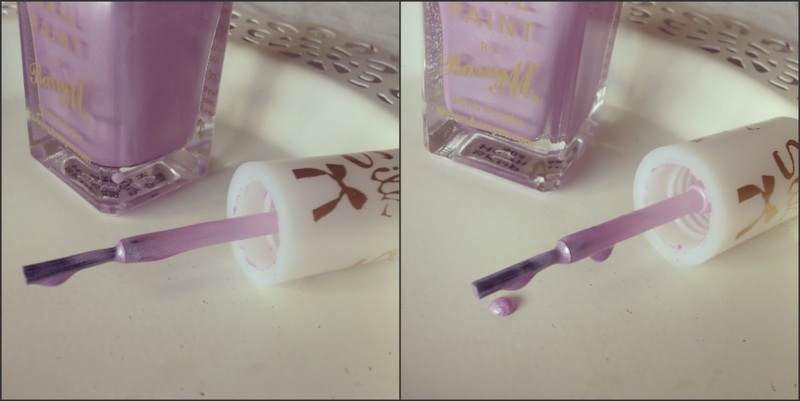 I was so excited when I spotted some of the new 'Silk nail paints' a couple of weeks ago in my local Superdrug, and Dan offered to buy me one, so I picked out the shade 'Heather' ... a gorgeous pastel lilac with hints of pearl shimmer! I couldnt wait to get home and try it out! The New Silk Polishes come in a range of adorable pastel shades, which are inspired by nature & perfect for wear this spring! They dry matte but have an undertone of sheen to give a sweet chic look! In typical Barry M fashion, The bottles cost £3.99 each - Bargain! The polish applied so smoothly and seemed to dry quickly too! I used 2 coats to get good opaque coverage & was so pleased with the pay off. I really love the look of this polish, it is so delicate and girly and not too OTT! I got about 3 days of wear out of the polish before it chipped (I do lots of housework and washing up so yours may last longer! ), which isn't bad considering the price! After using this shade to death since I got it, I am desperate to pick up a couple more of them, they are just so beautiful from every angle and I love the pearl look even though it is matte! I can see these being a nail staple for myself and many girls this season! I also wanted to add that I preferred the look of the polish when I did not add a top coat. The polish dries with a slight matte look so adding a clear top coat just makes it shiny again and it looses its intensity - you could try with a matte finish top coat, though! You can shop the collection in Superdrug stores and website now, where they are running an offer of 2 bottles for £6! 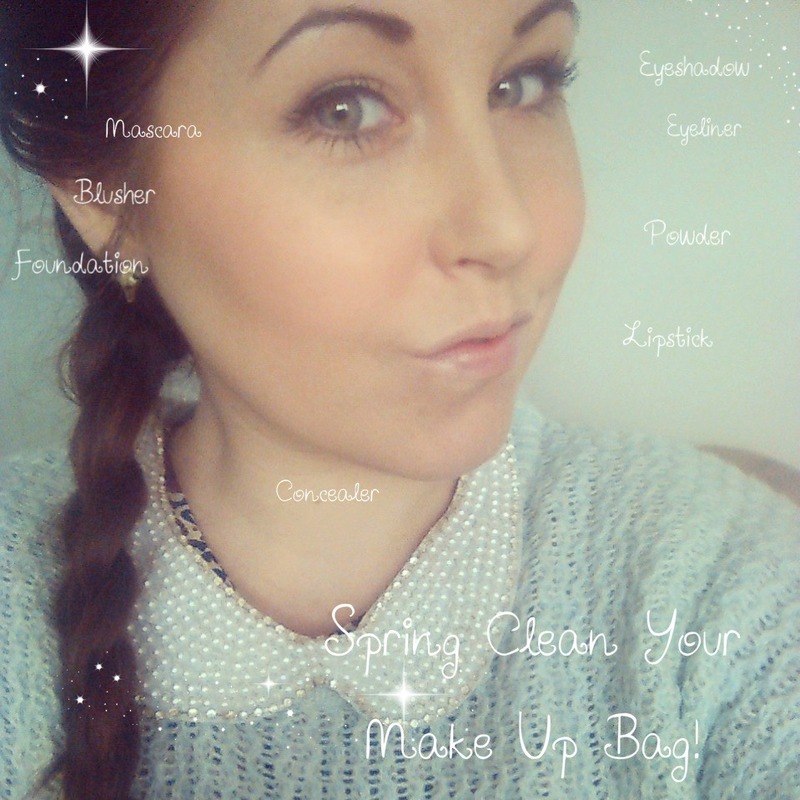 Spring Clean Your MakeUp Bag! We all have our favourite piece of make up that we just could not live without, or just cant bear the thought of parting with, but it is so important to bin your old make up regularly! So, with spring just around the corner, its not only time to spring clean your house and your wardrobe, its time to sort out your make up bag, too! Foundation is something that most of us use daily - but do as many of us know how long to keep it around? Most of us will use it all in this time space anyway, but if you still have some left, the best bet is to bin it! Foundation can clog up your skin leading to breakouts and spots, and if you keep it too long it will start to lighten - so it wont be any good anyway! A good tip to keep your foundation in top condition is to store it out of direct sunlight, as the UV Rays can damage the preservatives it contains! Lots of us use powders to set our foundation, the most important thing to remember about these is to ditch the sponge applicator that comes with most of them and use a brush instead - the sponges will just hold onto bacteria! If you notice the surface of the product starting to look shiny, its time to say goodbye - as all this oil will transfer to your delicate skin and can cause irritation. Another good way of telling when your powder is ready to go, is if it gives you dry skin when you use it! The best thing to do if you use powder make up is to keep your brushes clean - this will mean no dirt or bacteria will be transferred into the product and it will stay lovely and fresh for a flawless finish! Some of us don't use eyeshadow everyday and a lot of us tend to switch up our favourite shade depending on the season - so its important to know when you first opened your eyeshadow - you could put a little label on the bottom to help you keep track. Powder eyeshadows will stay good for 12-18 months. Because they are so tightly compacted and lack water it means that it is very hard for bacteria to contaminate them and spread. If you regularly wet your powder shadow to get a higher pigment, you should get rid of it after 6 months. Cream eyeshadows should be thrown out after 6 months, not only because they will have started to dry out, but also because they are a good environment for bacteria to breed - and you don't want to spread that to your eyes. The best way to maintain your eyeshadows is to not apply them with your fingers - dipping your fingers into the product will leave all the dirt and germs off of your hands on them and they will start to contaminate the product! Eyeliner is a great eye enhancer - but it can also be dangerous to the eyes if not cared for and if kept too long! It doesn't sound like very long but you mustn't forget that this product gets very close to the eye and because of the liquid nature it can breed bacertia fairly easily - and any bacteria that gets into the eye could potentially be harmful! Its better to be safe than sorry! Also, liquid Liners can dry out which means they wont perform as best they should and can begin to be flaky on the skin. Pencil Liners can stay with you for a little longer - up to 18 months is the best amount of time. This is because they get sharpened which creates a clean,fresh and bacteria free surface on them - you can make this even better by sanatising your sharpener regularly! 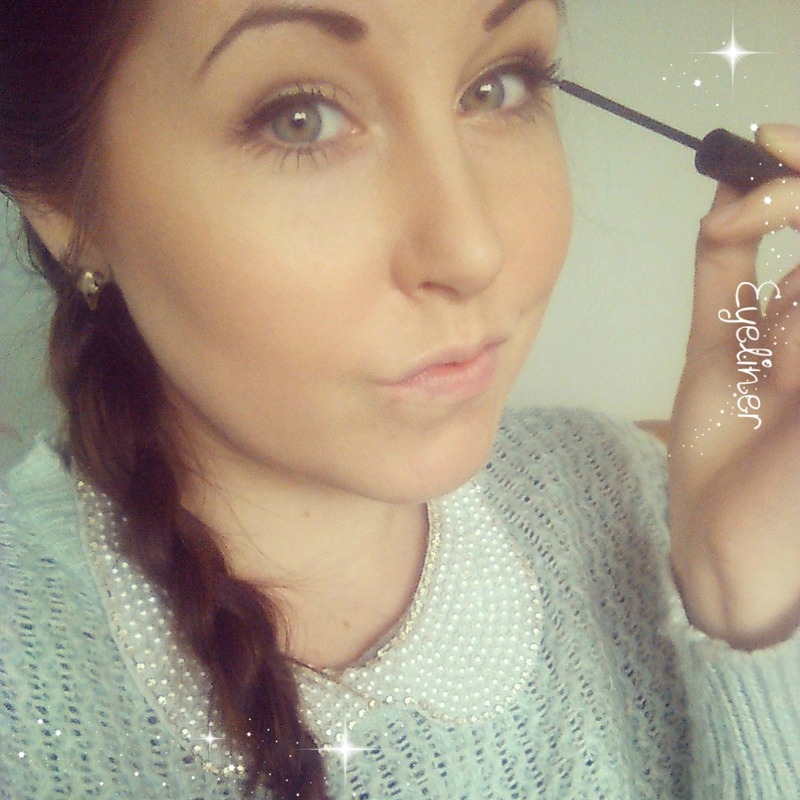 I dont know about you - but I love mascara <3 I love my eyes more though and taking proper care of them is essential! Mascara's should also be kept for 3 months! This is for many of the same reasons as your liquid eyeliner - they can breed harmful bacteria and can also dry out - try not to 'pump' your mascara in the bottle too much as this allows extra air in which will dry out the product far more quickly! Lashes add a real special touch to your eye make up but it is important to not re -use them too many times! You can hang on to your lashes for 4-5 uses! Just make sure that you remove them carefully - remove any glue that may still be attached to them and ALWAYS store them in their box - or dust and dirt could settle on them - and you dont want to be pressing that onto your eyes! There are certain lashes on the market (like velour lashes - here) which can be worn many more times as they are made from special materials! Just make sure you check the directions when you purchase yours! Concealer is a great product for hiding blemishes, but if you keep it past its best date - it can just create more problems rather than hiding them! Concealer is at its best for 6-8 months. Concealer is primarily used to hide dark circles and cover blemishes on the skin so of course it is going to harbour some bacteria - and you dont want to be continuously spreading that around your face! You could try applying your concealer with a sponge ot brush, as this will mean it will have much less chance of coming into contact with harmful dirt. Concealer can also begin to become flaky and dry when its past its best, so if anything it will highlight your blemishes rather than hide them! 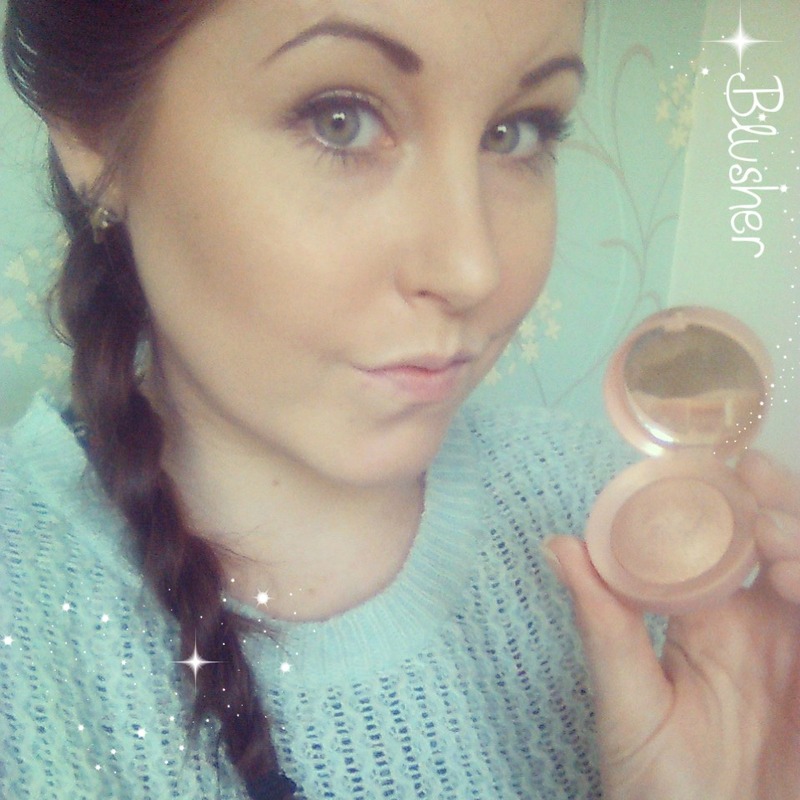 Blusher is a great way to give the face a little colour! Just like Eyeshadows, blushers can stay around for 12-18 months. Similarly, they do not contain water so aren't going to harbour a lot of bacteria - try to use a different brush to apply your blusher than you use for your liquid foundation, as this could contain moisture too which will promote bacteria growth in the pot of blusher. Lipsticks are oh so pretty, but if you keep them too long they can create problems such a ulcers - so don't get too attached! Lipsticks should be kept for 12 months! They are not made with water so wont grow bacteria on their own but are exposed to moisture when constantly applied to the lips, so this can mean they will begin to spread bacteria around! You will know your lipstick is ready to be binned when it starts to be hard and not spread properly - it will drag the lips when swiped across them and look blotchy! I hope you have found this little guide helpful! 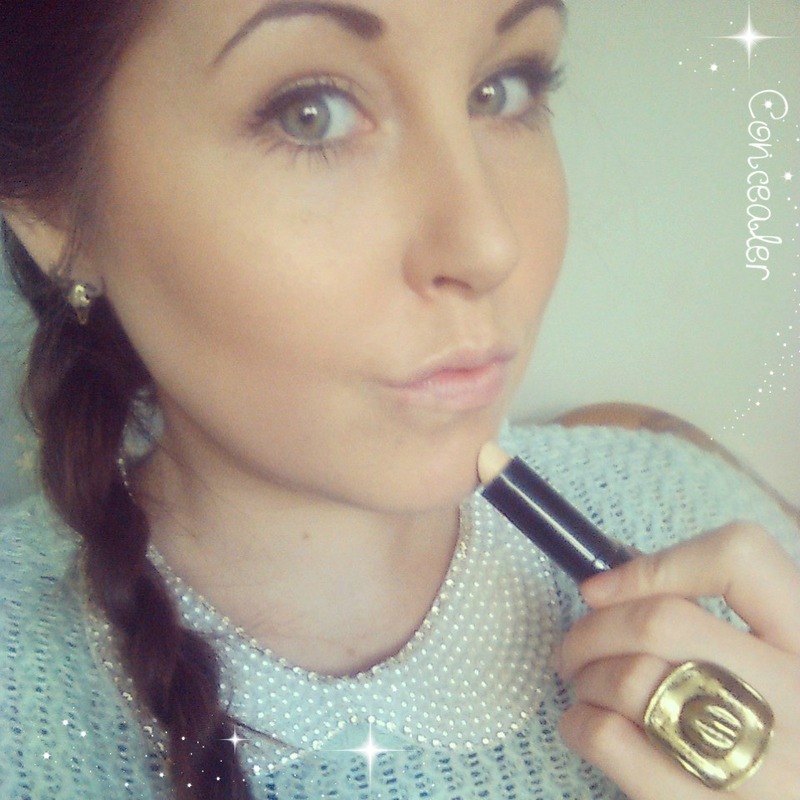 If you are ever in doubt about whether you make up has past its prime, just remember its better to be safe than sorry! Your mascara may make your lashes look larger - but it wont be so pretty if it gives you an eye infection! What is your top tip for makeup care?